This is my low number 1903, made in 1905 by SA, that I picked up a few months back. This is currently my favorate rifle in my collection. The rifle was more than likely originally made in 30-03, and the 04-09 SA barrel on it now could very well be it's original 30-06 barrel. The bore is in great shape for it's age. The receiver and barrel are Springfield armory, and most of the rest of the parts are Remingtion parts, I believe the stock is Remingtion as well, it has what looks like a very faint "RLB" stamped on it. And yes, I have shot it, and plan to shoot it some more in the future. I don't need the "Beware of the low number lecture" as I have heard it 1,000 times. It would seem like if that rifle was going to fail, it would have done so sometime in the last 112 years. Looks awesome by the way. Please post the results when and if you do take it shooting. It might help the naysayers. I am planning to make a trip out to the only range that has 100 and 200 yard targets sometime in August, I am planning to take this rifle and my turkish mauser, and if I have the stuff to relaod for it by then, I am also taking my type 99 arisaka. 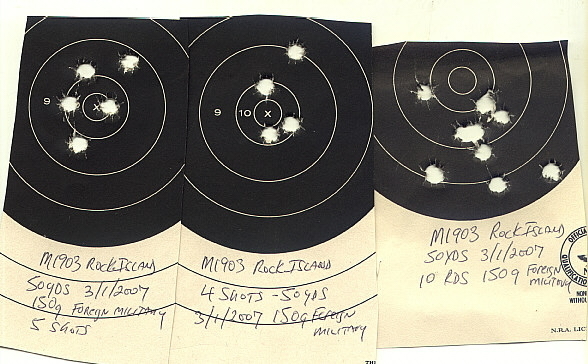 I will do a range report on all three. I can say that it has no problems nailing a 2 liter at 50 yards though, and that it shoots great. I have shot a few rounds of wwII m2 ball through it, and a few rounds of privi 180gr sp, that privi 180gr was pretty stout, much more so than I thought it was. I have no doubt that this rifle is safe to shoot after shooting that. The low serial number probably only hurts your resale value since the CMP has fairly clear warnings about these rifles posted. I've seen some online research done that suggests these rifles are "reasonably" safe to shoot. So reasonably, that the USMC used plenty of low serial numbers in WWII. The CMP wants to be completely safe from lawsuits and I can't blame them. I think a lot of failures were due to the quality of the ammo used at the time. If it weren't for a lower resale price, I'd have one myself and shoot it all day, or until my shoulder was thoroughly bruised. BTW, nice rifle. The early '03s are surely a classic! SWIHARTMARK wrote: The low serial number probably only hurts your resale value since the CMP has fairly clear warnings about these rifles posted. I've seen some online research done that suggests these rifles are "reasonably" safe to shoot. So reasonably, that the USMC used plenty of low serial numbers in WWII. The CMP wants to be completely safe from lawsuits and I can't blame them. I think a lot of failures were due to the quality of the ammo used at the time. If it weren't for a lower resale price, I'd have one myself and shoot it all day, or until my shoulder was thoroughly bruised. BTW, nice rifle. I would disagree. Most people who buy these rifles with low #'s are collectors like myself, and are not buying them exclusively to shoot them. I shoot my higher number "shooter grade" 03s but something like this to me is a collectible piece that would be added to my rack, and the lower the number in good condition is excellent to see. I don't consider it a shooter, it spends most of it's time hanging on the wall with my type 99 and turk mauser. But that being said, it is something that I plan to take with me every now and then once I start going to the longer ranges. I too have a very early '03 a Rock Island and it too has a 09 bbl. Nice , I have put thought into tracking down a SA finger groove stock for mine. But I'm not sure yet. Ask Tommy about his loads for the 1903 rifles. Gentle on the rifle and your shoulder. It does not have the hatcher hole. If that stock has an RLB stamp, it is worth selling to someone who needs a Remington stock and you could probably get a fair amount of cash for it. I'm probably not going to try to sell the stock, as the stamp is faded and I am not %100 sure it says RLB, it just looks like it might. This is the best picture is the best I have been able to take of it so far, if you zoom in you can see how faint the marking is. I believe it was towards the end of WWI that improperly processed brass (much too soft at the head) was used for a large amount of military ammo. In the Springfield a small portion of the case head just above the extraction groove is unsupported. Normally this isn't a problem but the soft brass occasionally ruptured. The sudden release of high pressure gas would blow off the top of the receiver ring in the more brittle actions. The "Hatcher hole" was to help vent the gas. Generally the bolt stayed in the rifle. I'd avoid pushing the limits with hot handloads with one; but reasonable mild loads, and using heavier military brass would do a lot to mitigate the risk. During WWII the Marines continued using low-number Springfields until they were replaced by the Garand. Guadalcanal was fought primarily with Springfield rifles. I haven't seen any reports of failures in the field.